We get a peek at The Vampire Diaries season 5, via a teaser; learn that NBC has committed to producing a pilot based on the medical thriller Outbreak; get a preview of Downton Abbey season 4 with a new trailer; hear that ABC has secured a semi-autobiographical comedy from Jay Baruchel; and discover that Syfy has ordered a pilot based on the science-fiction film 12 Monkeys. The Vampire Diaries returns to the CW with season 5 next month and we've got a sneak peek at all the upcoming drama. Check out the teaser below. While we don't get many plot details, the teaser does tell us that Damon (Ian Somerhalder) and Elena's (Nina Dobrev) relationship is still strong and that the main characters' dopplegangers are up to no good. We even get a glimpse of Stefan (Paul Wesley) stabbing his own "shadow self" Silas in the gut, or is it other way around? Based on the short clip, it's safe to say appearances could be deceiving and there will be plenty of surprises in store for longtime fans of the vampire drama. And since it looks like those shadowy alternates will be running rampant in the new season, Damon is eventually going to have to learn how to spell doppleganger. Check out the season 5 premiere of The Vampire Diaries when it airs on October 3, 2013 on the CW. NBC is developing a pilot based on the 1995 medical thriller Outbreak. The adaptation comes from ER producers John Wells and Jack Orman, who are attempting to bring another hour-long medical drama to the peacock network. So far, NBC has only committed to produce the pilot episode, but with some well-respected names already attached, the project could gain some traction. Like the original film - which starred Dustin Hoffman, Morgan Freeman and Rene Russo - the show would feature an ensemble cast of medical researchers and doctors who are tasked with containing a fast-spreading virus before it becomes a worldwide pandemic. It's unclear what other elements of the film the show would use, but the title will also remain the same. There are plenty of medical procedurals on television, but Outbreak would likely be far from your typical hospital-based drama. We'll have to see how the pilot comes together. We'll pass along more updates on Outbreak as they come in. The immensely successful ITV series Downton Abbey is set to return for season 4 and viewers are getting a preview this week with a new trailer (below). The clip is certainly short on dialogue, but in the montage of brief character moments, we see the Crawley family living life again after the tragic end of season 3. It appears that many of the acclaimed show's characters will mend fences with one another and attempt to pick up the pieces, which should comfort fans who were shocked and saddened by last season's conclusion. Season 4 will also introduce several new faces to Downton, including guest stars Shirley MacLaine, Tom Cullen, Joanna David, Julian Ovenden, Dame Kiri Te Kanawa, Nigel Harman, Dame Harriet Walter, Gary Carr and Paul Giamatti. ABC has landed a half-hour comedy from actor-writer Jay Baruchel (This is the End) that will be loosely based on his life. The project - which is co-written by Baruchel and his writing partner Jesse Chabot - is said to be semi-autobiographical of the actor's experience in Hollywood. The show centers on a successful actor who decides to leave the superficial world of the entertainment business behind and move back home to Vermont where he lives with two childhood friends down the street from his mother. While it may seem ironic that Baruchel is developing a show for the industry he seemingly doesn't want to be a part of, he's decided not to attach himself as a star. That move certainly fits the premise and the character in the show, but it's still surprising that ABC is so interested without him in the lead. Then again, it's unclear how much the network has invested, but we do know it fought with several other networks to land the project. We'll keep a close eye on Baruchel's new show and let you know how it develops. 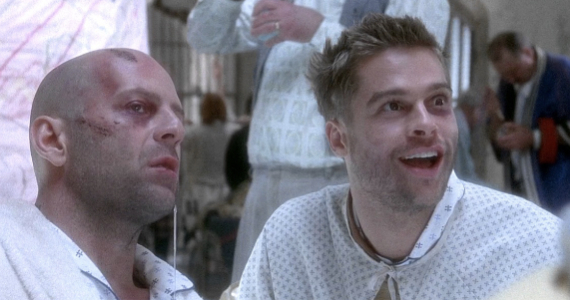 Syfy has ordered a pilot for a 12 Monkeys TV series. A month back, we heard that the network was moving forward with plans to develop a TV adaptation of Terry Gilliam's 1995 science-fiction film and apparently, things are moving quite quickly based on the pilot order. The hour-long pilot was written as a spec by Terry Matalas and Travis Fickett (Terra Nova) and marks the second project adapted directly from a feature film that Syfy has snatched up this year, with the other being Dominion, which is based on the 2010 film Legion. The show follows a time-traveler from a post-apocalyptic future whose mission is to find and destroy the source of a plague that will end up decimating the human race. In the film version, Bruce Willis' character was sent back in time to find a sample of the original virus so that scientists could attempt to develop a cure. While Gilliam's film managed to find an audience that loved its originality and plot twists, the movie's financial success was largely credited to its stars, Willis and Brad Pitt. Since 12 Monkeys is relatively well-known to science-fiction fans, Syfy may not need to attract as big of leads, but it will certainly need to land some talented actors, who can carry the heavy dramatic weight of the series. We'll pass along those casting announcements when they come in and let you know if Syfy orders 12 Monkeys to series.